Breakfast has always been the most difficult meal of the day for me – I struggle with what to have that will be filling and nutritious but not take a lot of time make. When I read about the Engine 2 food plan and Rip’s Big Bowl for breakfast I knew it was going to be a winner! Hubby Tom happens to love cereal so he was super excited about this new breakfast. 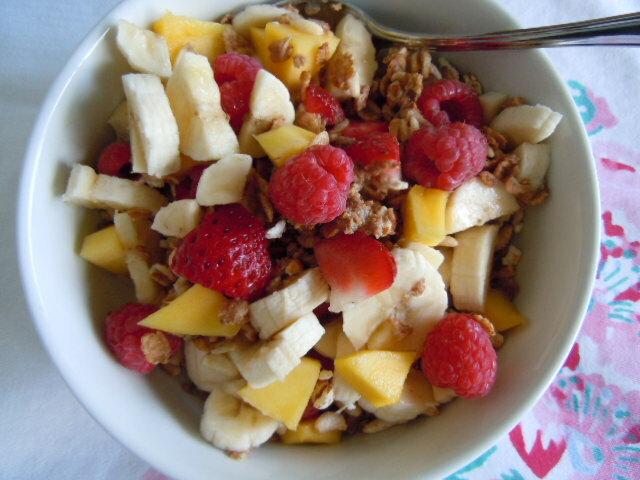 You make this with an assortment of your favorite healthy cereals and what ever seasonal fruits you have on hand. You can even thaw out some frozen berries and toss those in as well. 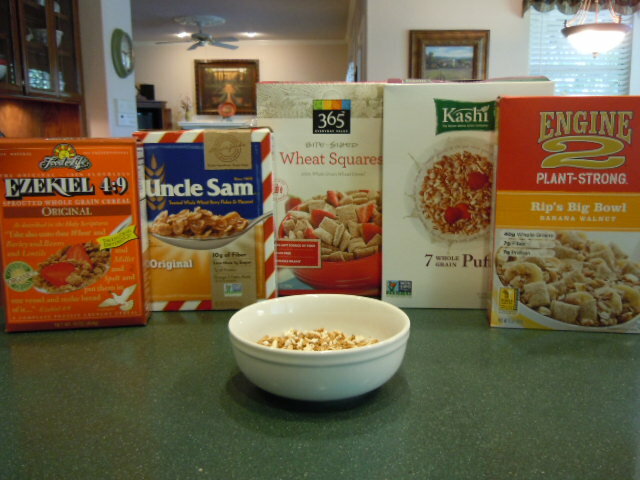 These are three of my favorite cereals – I also like plain oats but forgot to photograph them. I weigh out half a serving of Eziekel and Uncle Sam and a full serving of Kashi Puffs and sometimes I add 1/4 – 1/2 cup uncooked oatmeal. 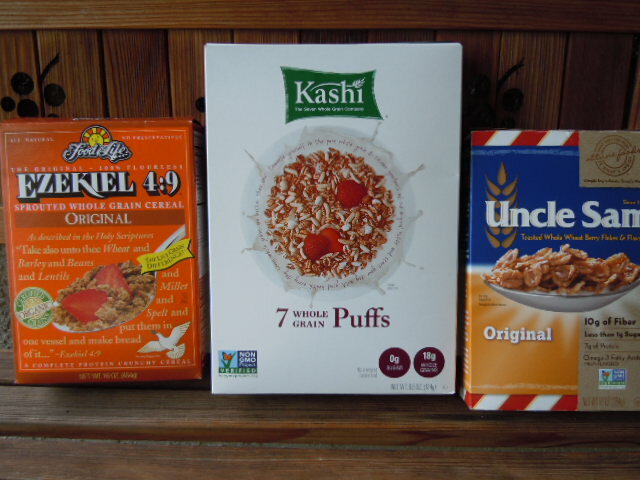 Ezekiel is 190 calories for 1/2 cup – it’s super crunchy like Grape-nuts cereal, Kashi Puffs is only 70 calories for a full cup and Uncle Sam is 3/4 cup for 190 calories – it does contain flax seed but they are whole not ground so they really don’t do you much good because they need to be ground up before you eat them – but the cereal tastes really good! These are hubby Tom’s choices. The Engine 2 cereal is available at Whole Foods and it is already a mixture of several cereals with dried fruit and walnuts. There are different flavors to choose from. It would be a good choice to take with you when traveling since it contains everything in one box. Note to self – remember this for vacation! 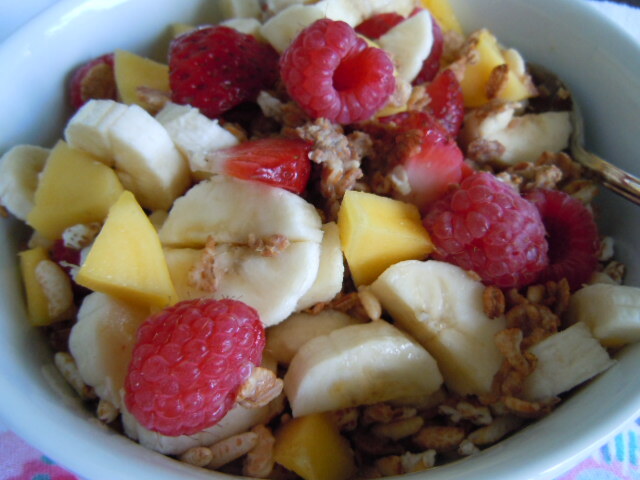 Mix your cereals together and add a small sliced banana, a little fresh mango and a few fresh berries. Hubby Tom also adds walnuts to his and if you want you can add ground flax seeds, hemp seeds,chia seeds or pumpkin seeds for additional healthy fats. 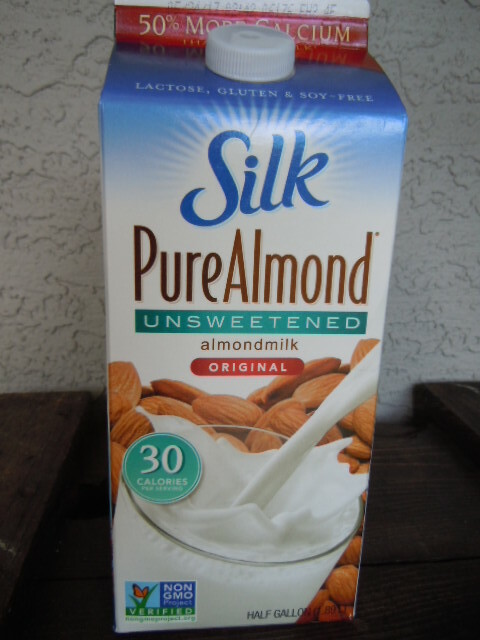 A splash of Silk Almond milk – unsweetened and breakfast is ready! This Big Bowl weighs in at 330 Calories, 6g fat, o Sat fat, 0 Trans fat, o Cholesterol, 11g Protein, 69 Carbs, 12g Fiber. It fills me up, has some crunch to it and sweetness from the bananas and berries. It’s a bowl of sunshine! If I add dry oatmeal to the mixture its comes in around 400 calories but it’s super filling! 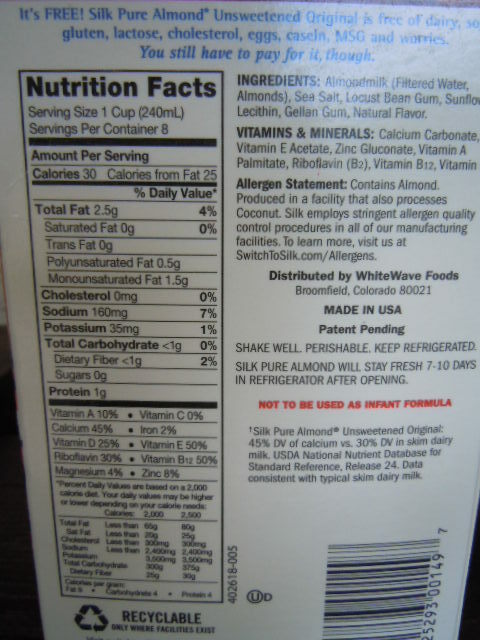 I have won hubby Tom over to unsweetened almond milk. We use it in our smoothies, soups, salad dressings, oatmeal, breakfast bars and cold cereal bowls! To make this quick and easy breakfast even faster to toss together we are going to measure out our cereal portions into individual containers for the coming week so all we have to add is the fruit and almond milk. It’s a sad week for our nation with so many tragedies that have resulted in loss of lives. My heart hurts as I pray for all the victims and their families. This morning we had to shut off the TV and take a break from the news. We went for a walk outside and took in all the lovely things that nature has to offer. 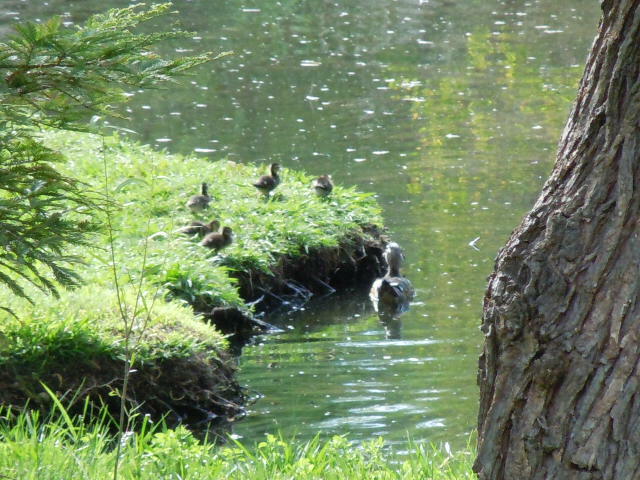 We live next to a little pond and one of our Spring time pleasures is seeing the first baby ducks of the season. This photo was taken this morning from our backyard. The babies move so quickly it’s difficult to get a shot of them that isn’t blurry. Watching them dart around the pond makes me happy. 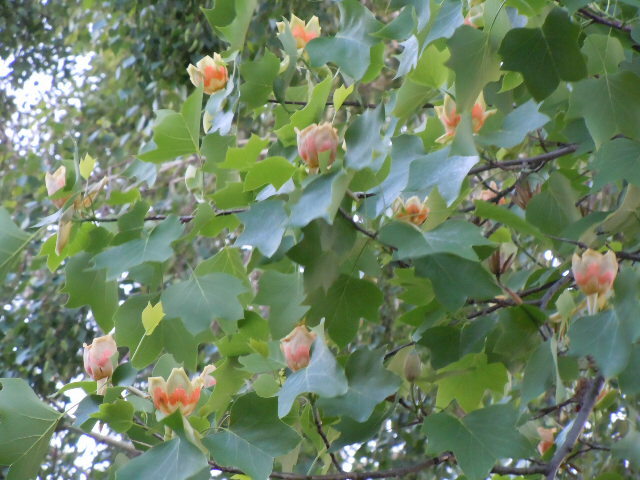 Have you heard of tulip trees? Before moving to California I had no idea such a thing existed. 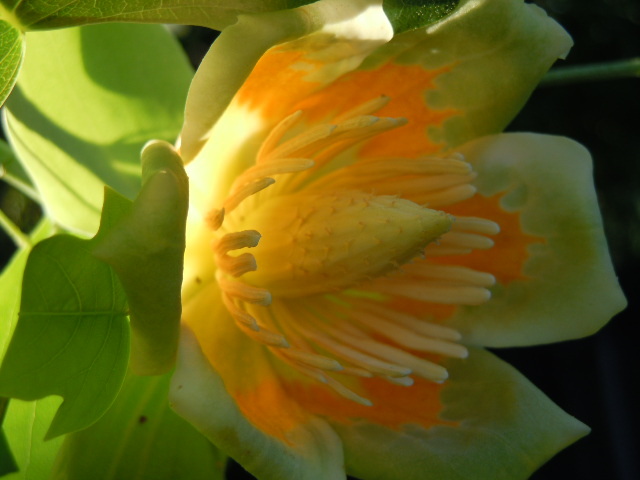 We have this huge tulip tree in our backyard and right now it is full of these lovely tulip shaped flowers. I can see this from my kitchen window while I wash dishes. Another sign that Spring is finally here. How amazing is this? The beauty of nature makes me happy. 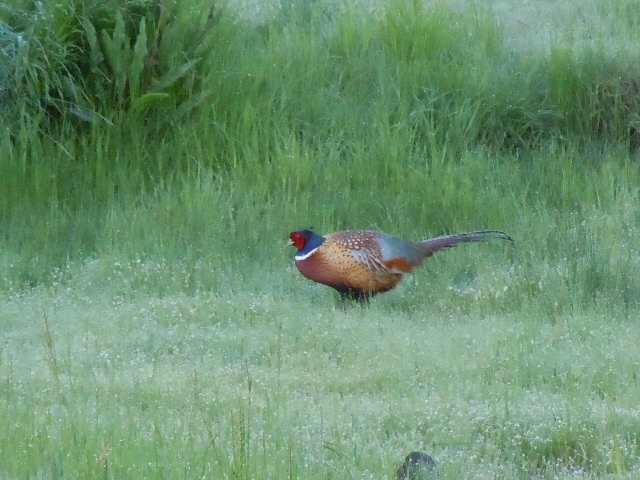 This pheasant photo is one we got a week or so ago as we walked along the nature trail near our home. He isn’t afraid of us – in fact he stopped and stared us down before he slowly walked away. He is usually in the same place each morning and sometimes we see his mate but this week the grass is really tall and we can’t see him. After we pass the area he is in, he crows to let us know he is there! He makes me happy! Okay this next photo isn’t nature but it’s something that takes me where nature is! I got a new street bike! For my first ride hubby Tom took me on a 13 mile ride around town. I am learning how to shift gears – it’s a lot different than the mountain bike I had. It’s so light weight and easy to pedal – making it a joy to ride. It’s easy and kind to my post surgery foot too. Now we have an alternative activity when we don’t have an entire day for hiking we can bike ride! 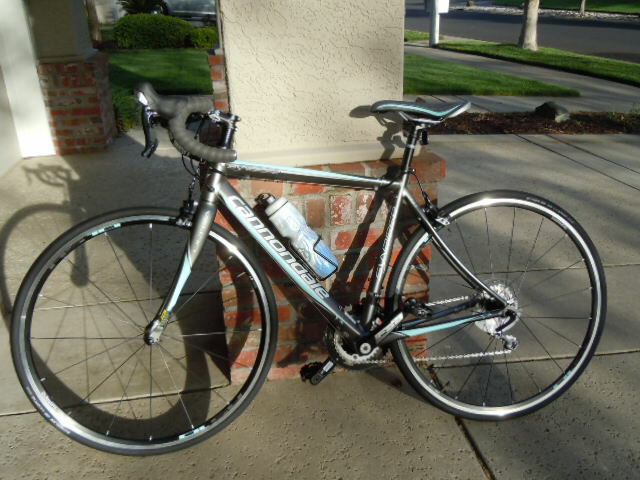 We hope to go on the American River bike trail this weekend for a longer bike ride. I got my first pair of padded bike shorts – I think I am going to need them too! My new bike makes me happy! Wishing you much happiness and a safe weekend. I’m glad you are here. Feel free to leave me a comment or ask a question. Gorgeous photos Tami! 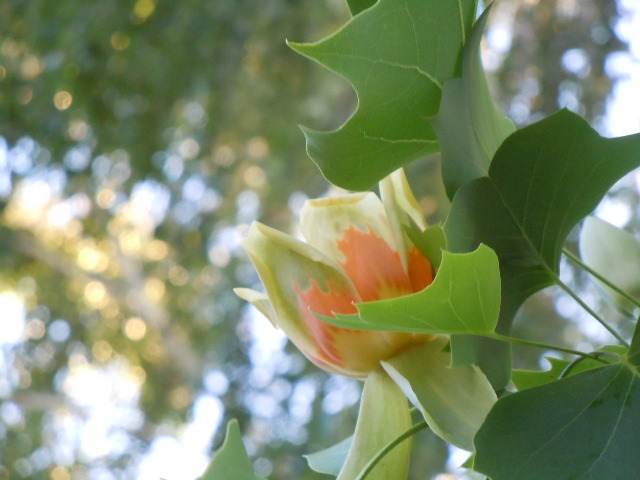 Do you know when we lived in our first house here in Ohio, we actually had a tulip tree on our property? That was the first time I ever heard of them. I don’t really know what region of the country they are indigenous to. I agree, all this news coverage is making me feel on edge. I had to turn it off as well. Have a lovely weekend. Renee I just learned from Sharon that Tulip trees are the state tree of Tennessee! I had no idea. They sure are pretty! I’m fairly certain it’s the same thing, but here we call them Tulip Poplar trees and they are actually the state tree of Tennessee. So now you can think of me while you are washing dishes!! LOL! Love your new bicycle! Sharon thank you for the bit of interesting facts about Tulip trees! I am learning new things all the time. 🙂 I shall think of you as I wash dishes! 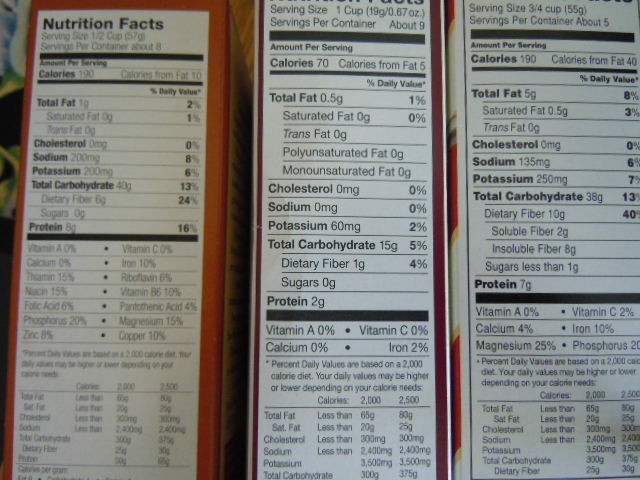 That cereal – even the healthy ones – are still crack for me – I LOVE THEM & hard for me to portion control – I KNOW – even me. I stopped buying the Kashi protein ones cause I loved them so much! 🙂 I have some KIND granola in the house right now – great stats – healthy – I WON THEM! 🙂 I am trying sooooooo hard to portion control! 🙂 That is one dish of goodness though! LOVE the pics & yes, need to get away from it! Glad as of right now they caught the 2nd one! 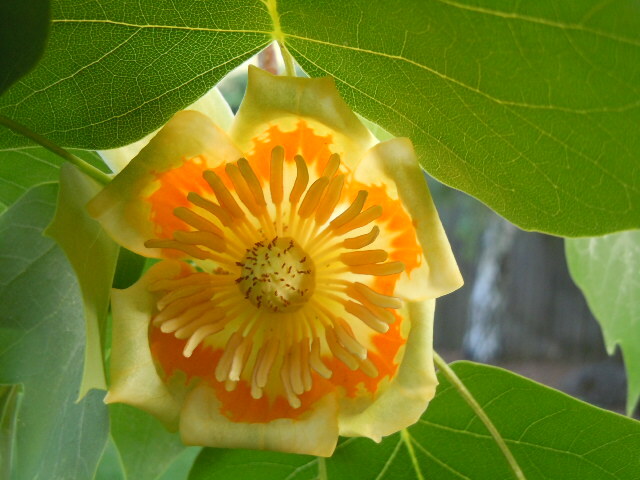 I am in CA & NEVER heard of a tulip tree- I WANT ONE!!!! BEAUTIFUL!!!!!!! What a wonderful walk AND love your new bike! Jody we all have our list of trouble foods! How great that you won KIND granola – delicious! I really love cereal, and this post reminded me of that! I can’t even remember the last time I had an actual bowl of cereal with milk…..can you believe it?! I’ve been hooked on my Kashi Go Lean with Greek yogurt for about 3 years now. It’s an addiction. BTW, I tried the caption for spam yesterday when I was posting a comment, about 10 times, and it never worked! Has anyone told you that?? No one else has mentions a problem with the caption – thanks for letting me know. I hate those things but they are a necessary evil! Sunshine and warmer weather makes me happy too Cammy! Tami! Hi!!! I love your website… lovely photos and great recipes. I just saw that you are in NC…. where? I’m in Waynesville! I have been a long time follower of your website. I have enjoyed many of your recipes. This is the first time I have commented though. I too am looking for a more healthful way of eating and am inspired by your new approach. I watched the Forks over Knives documentary and have ordered the Eat for Health Book. The documentary was an eye opener. I bought the Rips Big Bowl cereal at Whole Foods yesterday and I think I will try and make up my own since I think it will be a little less expensive that way. Thank you for the inspiration!!! The most beautiful flowers and plants I have ever seen have been in California! Glad you and the family are doing well, Tami! We grow ’em good here Dr J! Hi Tami. I LOVE your photos. Thanks for sharing the happiness with us. Jut following your lead Roz! When diagnosed with Celiac Disease I really missed eating good tasting cereals. I tried a lot of other gluten free cereals and they were not filling, would get soggy, and often were so full of sweeteners, they even left my mouth feeling raw. Perky’s Nutty Flax is awesome! It is filling, not too sweet, tastes great on yogurt or can be eaten alone. And it stays crunchy for a long time, an added bonus for a busy mom in the mornings. I highly recommend this cereal for anyone with Celiac Disese that used to love cereal. In fact, I need to start buying this in bulk since the rest of my family discovered it and loves it. I is so nice that my kids, who do not have Celiac Disease, eat a healthy cereal like this. What a wonderful website! I forwarded your recipe for the flax/sesame crackers to my daughter in AZ. I can’t wait to try some of your recipes. The photos are beautiful – soothing. Very cool! Hi Lisa! Thank you for the kind words – I hope you will come back often and give me some feedback when you try some recipes!